an exhibition for timelab in the context of the project 33 years of space. 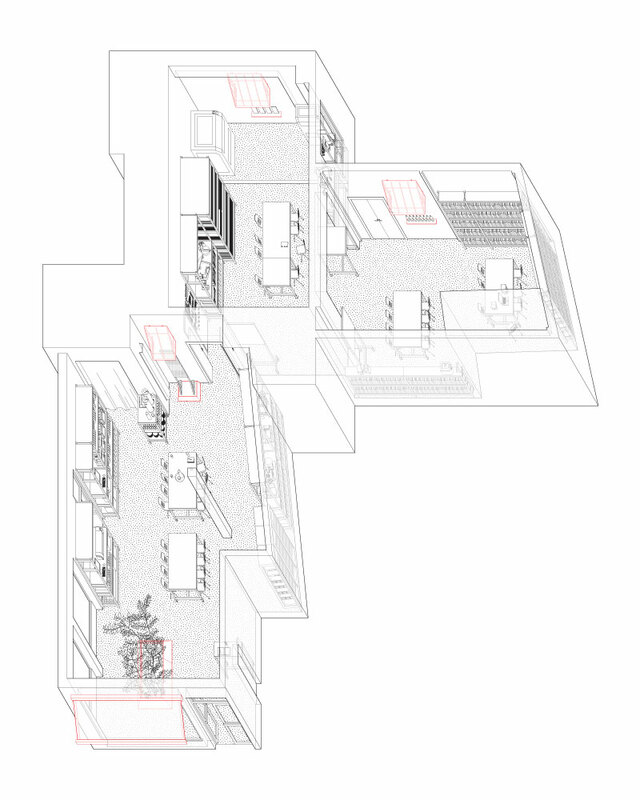 1 – axonometric drawing. 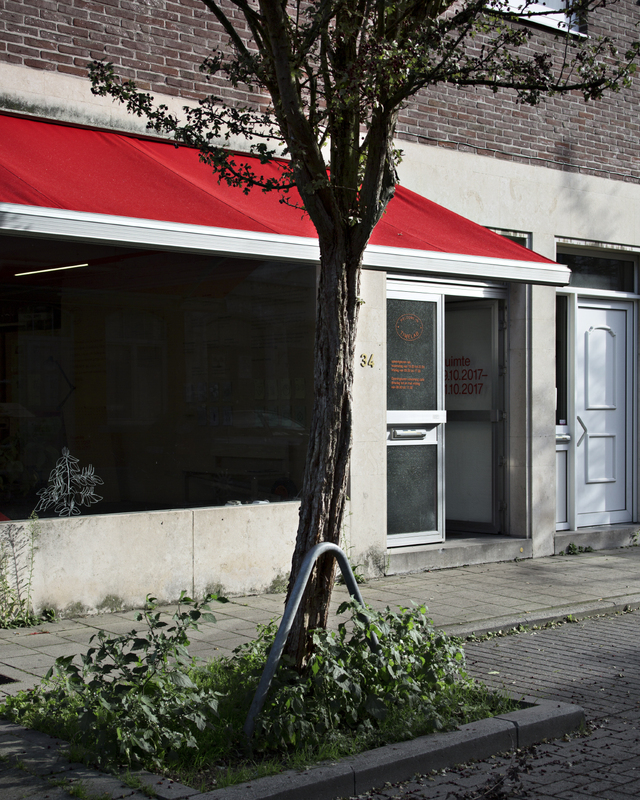 four red fabric awnings define areas of exhibition. 7 – spread from the exhibition publication. a publication was produced to describes the content and context of the exhibition. 8 – spread from the exhibition publication. the publication takes on the function of traditional exhibition graphics. no text or captions are present within the exhibition itself. 9 – spread from the exhibition publication. by connecting the exhibition areas to existing projects within the space, the context of timelab itself becomes the content of the exhibition. 10 – spread from the exhibition publication. a deconstructed/reconstructed list demonstrates open-endedness of the concepts explored in the exhibition. 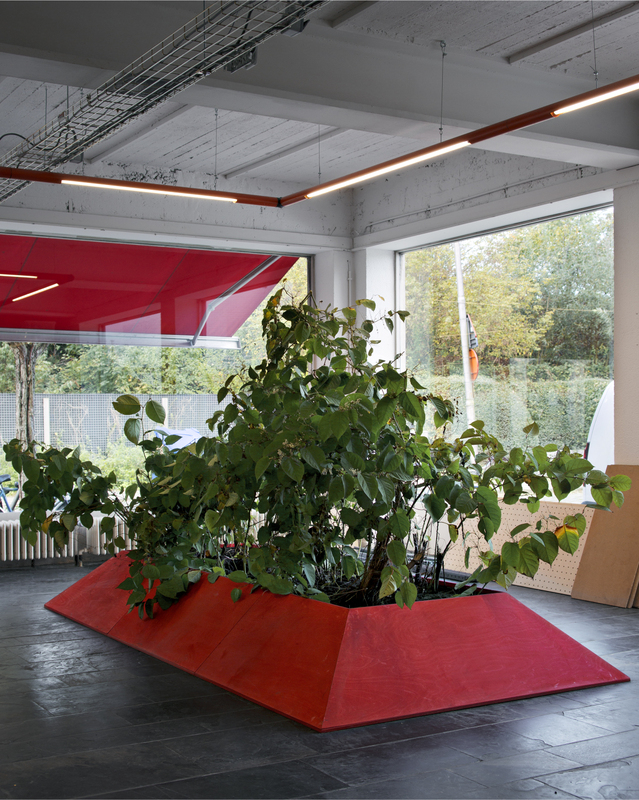 the exhibition ‘ruimte’ was designed by common room and co-curated by common room, timelab, and jan leyssens in the context ’33 years of space’, a project encompassing the design and renovation and occupation of a new building for timelab. 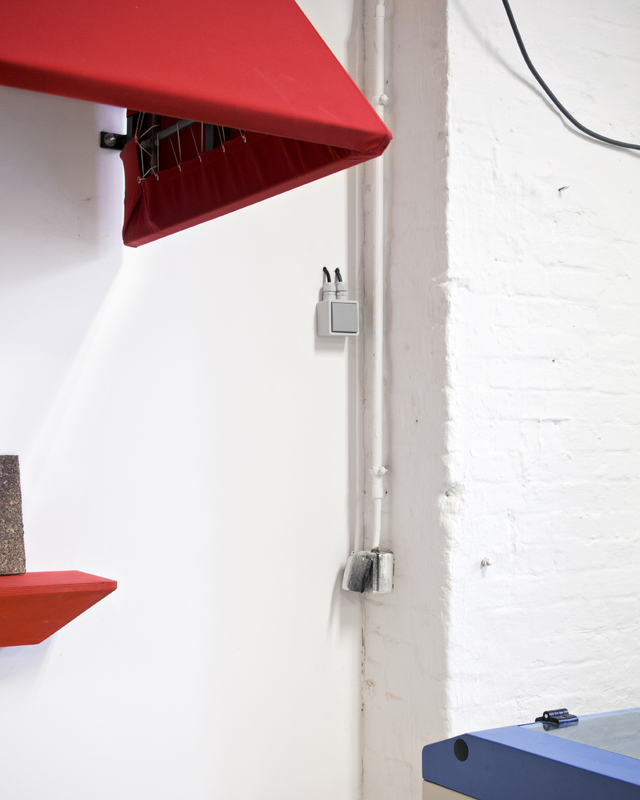 ‘ruimte’ was located in timelab’s new storefront space, organized in and around the existing equipment and activities. 8 patterns (principles) that guide timelab as an organization, were used as the narrative for the exhibition. The ‘knotplex’ project was employed as a case study to illustrate how these different patterns work. 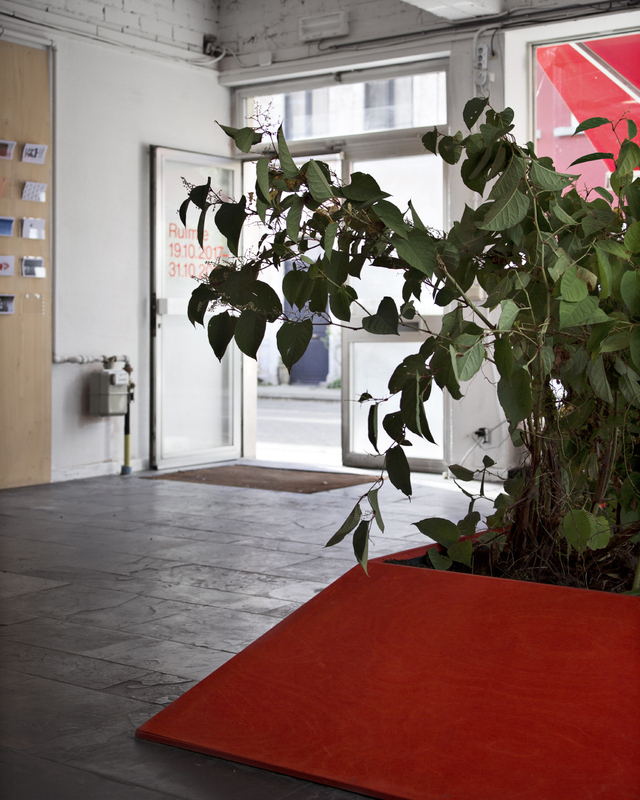 prompted by the old unused storefront canopy of the timelab space, the awning became the organizing device of the exhibition. the existing fabric of the storefront canopy was replaced with new red fabric and three new steel frame awnings with the same red fabric were produced. the four canopies were used to create distinct areas to display different aspects of the ‘knotplex’ project. 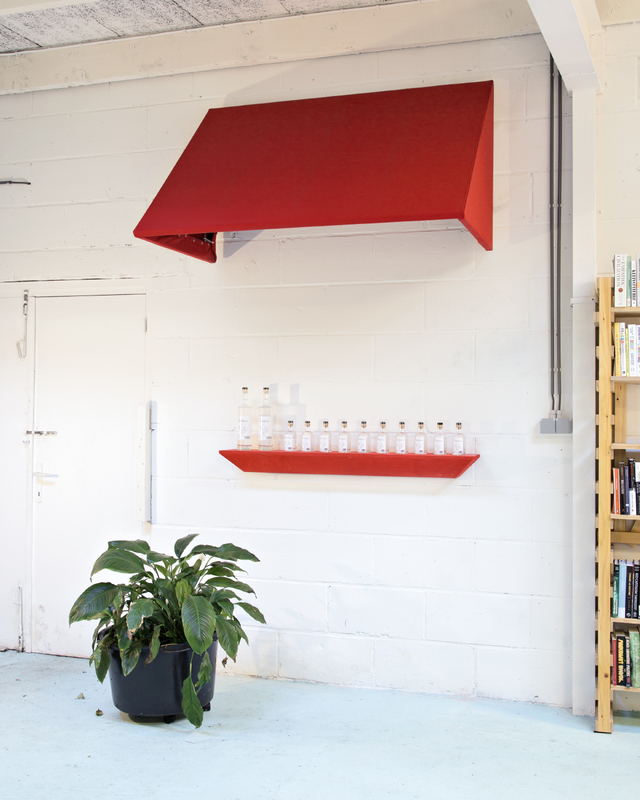 red-stained plywood furniture was designed to display the project material under the awnings. the scale and color of the awnings and furniture created spatial differentiation within the space between the display areas and the ongoing daily activities. the layout of the exhibition was arranged to lead visitors through the entire space, exploring both the exhibition’s specific content and timelab as an organization in general. the exhibition did not include traditional exhibition graphics or captions. instead, a publication was produced which acted as a guide through the exhibition and timelab as an organization. by linking the ‘knotplex’ to other projects located within the space, the context of timelab itself became the content of the exhibition, engaging both existing members and new visitors in an ongoing conversation.